Emma Hein fields a ball for the Lady Jets in a softball game with National Trail. The FM Lady Jets battle at the plate in game with the National Trail Lady Blazers. Belle Cable pitches for the Lady Jets softball team in game with the Lady Blazers. The Lady Jets had a slow start against the National Trail Blazers. They nearly had a disastrous first inning but were able to wiggle their way out of a bases loaded situation. But they were not as fortunate in the fifth inning when Trail dented the plate five times. The Jets attempted to rally in the seventh but it was simply too late to make a serious run at the Blazers. At games end it was 7-2 in the favor of Trail. After the game the coach would remark that this was the third game in a row where he had to take a time out in the first inning to get the team focused and get out of early trouble. The team had allowed the bases to be loaded partly due to an error and a walk. There was only one out. But after the coaches time out infielder Belle Filburn turned a double play by tagging third base for the force out and throwing out the batter at first. The two teams played even for the next few innings. Base runners were few and far between for the Jets most of the night. They had problems hitting Trail starter Weaver. But in the fifth inning Trail adjusted to starting pitcher Hein. They started to knock the ball around and advance base runners. The Jet defense did not help their cause as they made some mental mistakes that compounded the damage. Trail tacked on a couple of insurance runs in the sixth inning. It was poised to be shutout for Weaver as the Jets came to bat in the seventh. Brumbaugh was the lead hitter and got a basehit. She stole second base and put herself in scoring position. But she wasn’t done yet. Henninger made contact and there was a throwing error to 1st base. A determined Brumbaugh ran through a stop sign at third base and sailed to home plate and spoiled the shut out for Trail. Henninger would score herself when Belle Cable drove her in with a hard hit ball. But that would end scoring for the Jets as the next batter grounded out. They had found their offense too late. 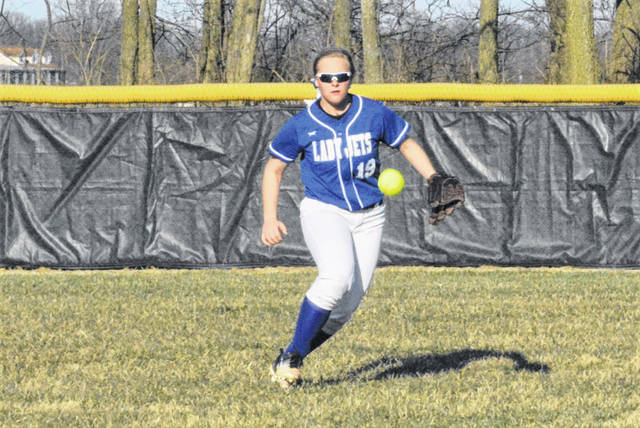 https://www.dailyadvocate.com/wp-content/uploads/sites/34/2019/04/web1_FM-SB-thursday-a.jpgEmma Hein fields a ball for the Lady Jets in a softball game with National Trail. 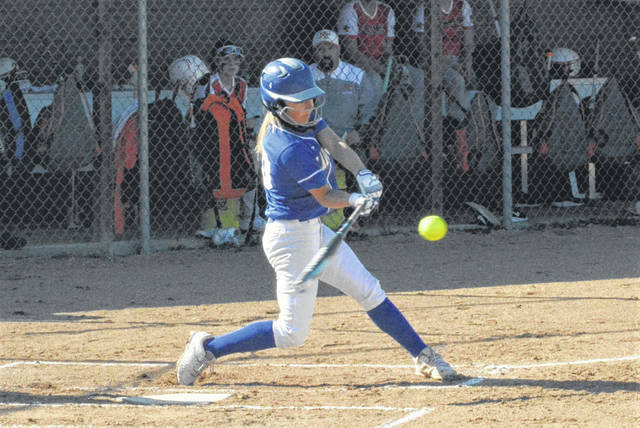 https://www.dailyadvocate.com/wp-content/uploads/sites/34/2019/04/web1_FM-SB-Thursday-b.jpgThe FM Lady Jets battle at the plate in game with the National Trail Lady Blazers. 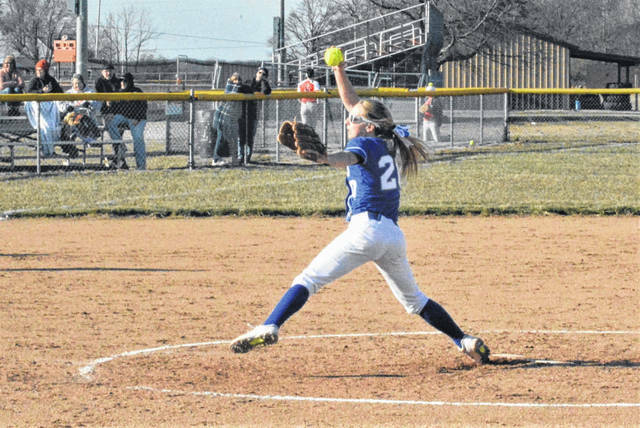 https://www.dailyadvocate.com/wp-content/uploads/sites/34/2019/04/web1_FM-SB-Thursday.jpgBelle Cable pitches for the Lady Jets softball team in game with the Lady Blazers.